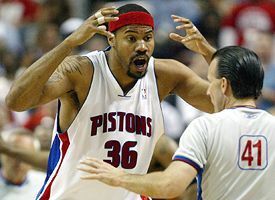 Then I figured it out: Thanks to the new “Rasheed Wallace” rule, players weren’t bitching and moaning after every foul call. By coming up with this wrinkle, was David Stern hoping to divert attention away from the fallout from last season’s playoffs, when the brutal officiating brought back memories of the Allies-Nazis game in “Victory”? Yeah, probably. Still, you have to admit, players were whining and fussing in epidemic proportions. Nobody believed he could actually commit a foul. Even some of the better character guys (like Tim Duncan and Tayshaun Prince, to name two) were reacting after fouls like somebody had just stuck a parking ticket on their car. It was a disgrace. It seemed like they felt obligated to protest every call, like the one moment during the Spurs-Mavs series when Brent Barry was whistled for a foul and ran a few steps in disbelief, but you could tell his heart wasn’t really in it, like he was doing it on autopilot. For the rest of the summer, I kept an eye on the player-referee interactions as much as the old games. Rick Barry and Dave Cowens were famous for complaining about calls in the ’70s, but much to my horror, two members of my beloved Celtics made bitching an art form in the mid-’80s: Danny Ainge and Kevin McHale. If you want to blame anyone, blame them. Barkley took it to another level, followed by Chuck Daly and the Bad Boy Pistons, Gary Payton and Sam Cassell and, ultimately, Rasheed and Antoine Walker in the mid-’90s (the Pacino and De Niro of this discussion). By the middle of this decade, thanks to everyone in this paragraph, everyone felt obligated to protest every whistle. The incessant complaining looked bad on TV and even worse in person — just play after play of guys getting called for fouls, hopping around like little kids, then debating with the referees like an attorney haggling with a judge. Like everyone else, I hated watching it. Now? The refs have been given authority to whistle technicals on anyone who pulls that crap. The league will be better for it. You will see. Maybe the level of officiating will even be better for it. If last season’s performance was a collective D-plus — and that’s being kind — we might end up with a C-plus this season simply because the refs won’t have to worry about being shown up every other play. And if that’s not enough, watching ‘Sheed and ‘Toine internalizing their emotions could end up being the funniest ongoing subplot of the 2006-07 season. Well, other than the Knicks. So that’s just the first of 33 reasons you should be intrigued by the upcoming season. Here’s every other absorbing subplot to get you ready for the next nine months.